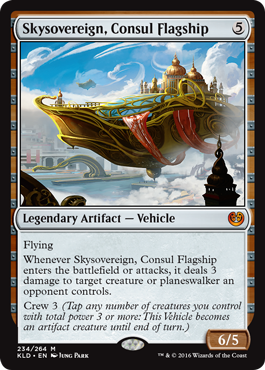 If there's anything we know about Kaladesh, it's that. With preview season well underway, tons of awesome new cards are sparking the imaginations of players everywhere. Many of those cards? Artifacts. 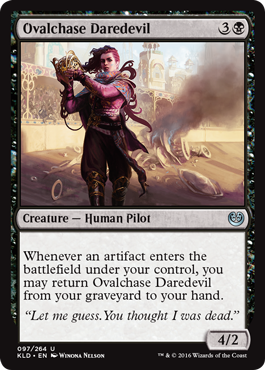 The good news is we don't have to be archeologists with a wall full of degrees and a briefcase full of tiny, adorable brushes to find artifacts in Kaladesh. All we need is our brains, some ingenuity, and a whole lot of Aether. 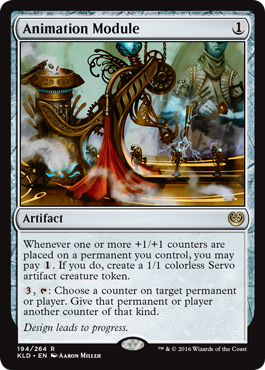 Good thing Kaladesh has plenty. 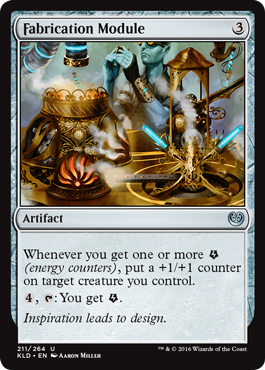 The spirit of invention is highly prized on Kaladesh, with the best inventors awarded money, fame, and of course more Aether. 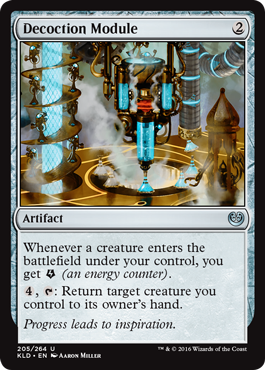 The spirit of invention is also highly prized in Magic, with the best brews taking down anything from Friday Night Magic to a Grand Prix. 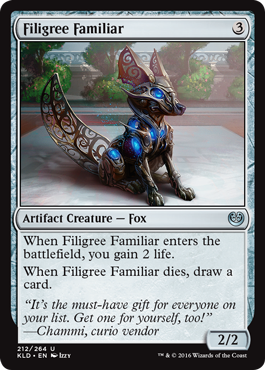 Giant walking automatons, cute filigree Fox friends, and speedy Vehicles looking for a crew are just some of the artifact cards we've seen previewed. I'm sure plenty of you are already dreaming up sweet, chromed-out decks that make good use of these shiny new tools. Well, guess what? I've got another tool for you. And it's a fun one. Does anyone else hear their dad talking in that flavor text, or is it just me? While not an artifact itself, Refurbish relies on a deck full of artifacts to be at its best. Or, at the very least, it needs a deck with a few super sweet artifacts. Good thing that neither option seems like a tough proposition on Kaladesh. In Limited, this card is a respectable pickup. It shines in the mid-to-late game, when you'll have the flexibility to get back exactly what you need, exactly when you need it. Maybe you'll get back something with evasion, maybe it'll be a big, beefy blocker. Or maybe it'll be something with an enters-the-battlefield effect to eke out extra value. After all, who wouldn't want to get their bomb back from the graveyard and put it into play? Especially when you don't have to pay its casting cost. That last sentence is one of the most exciting things about this card. Say you're in the late game and you've been trading creatures with your opponent left and right. Imagine that your Demolition Stomper died in combat (don't ask me how that managed to happen), but it fought a good fight. Who wouldn't love to get it back for 3W instead of the original casting cost of six? Crew that puppy up, and it's ready to get back into battle. As I mentioned, Refurbish also combos well with cards that have enters-the-battlefield effects. I'm a big fan of Filigree Familiar—so I'll use it for this example. Say you're playing Standard and use the Fox to emerge a big Eldrazi. Wouldn't it be great to get that little Fox back so you can gain life, draw a card, and emerge all over again? If Kaladesh has any discard outlets, Refurbish ends up looking even stronger. 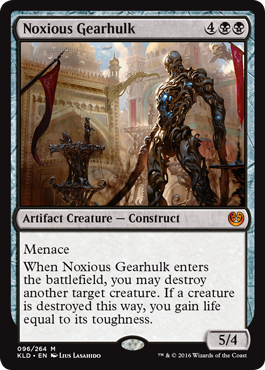 A turn-four Torrential Gearhulk? Yes, please, I'll take two. Kaladesh doesn't even necessarily need discard outlets—anything that gets cards into your graveyard will do. Take Laboratory Brute from Eldritch Moon for example, which mills you when it enters the battlefield. How about getting back a card that's not a creature? 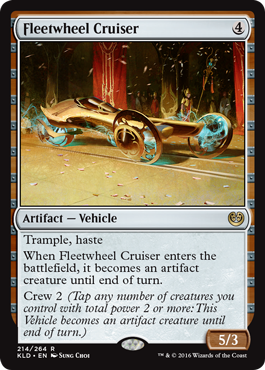 I can think of some pretty absurd Cube scenarios that play quite well with Refurbish (cough, Black Lotus, cough, cough). Getting back a Metalspinner's Puzzleknot is also nothing to sniff at. With Refurbish, it's okay to be a speed demon! Getting back your hasty high-power, low-toughness Vehicles from the graveyard is another pretty sweet proposition. Cast your cars and crash in for huge chunks of trample damage, then get them back from the graveyard and do it all over again. It's also a flavor-win if you think about the graveyard as a salvage yard, Refurbish as your auto mechanic, and yourself as a wild and crazy Aether racer. We're living in a brewer's paradise. 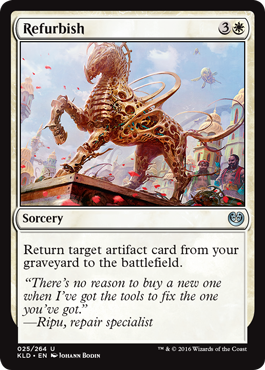 In Constructed formats, particularly if you're playing an artifact-driven combo deck, Refurbish offers a kind of "combo insurance" that will save you from opponents who try to mess up your well-laid plans. Perhaps something spicy exists that uses some of the new Modules? If you're able to set it up well, Refurbish is sure to be an excellent addition to your deck. As more preview cards are unveiled, keep your eyes open for some that might work extra-well with our new friend. And be sure to keep saving up that Aether—you're gonna need it!